All of January: Venus retrograde in Capricorn promotes us to make various upgrades, i.e. we introduce better-serving systems into our lives, more efficient procedures; we create better web presences, and nicer wardrobes. People in estranged relationships might reunite for emotional as well as practical reasons. Jupiter in Cancer moves into Leo July 16th: When Jupiter is in Cancer, people tend to go on an inner journey concerned with personal growth and preparation, often for some new offering or venture. When it moves into Leo, they are more outgoing, presenting something to the world, and on stage in some new way. This astrological framework is helpful so you're not concerned if you are inward-focused the first half of the year; it's natural. 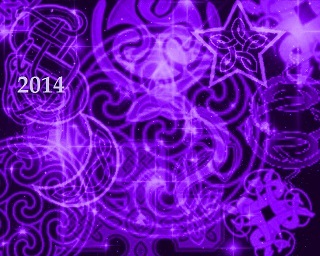 Grand Cross of Spring 2014: Really intense!! The cavalcade of change-invoking circumstances in 2013 continues, only with greater intensity. Life highlights a choice: Are you choosing to shrink your world, or learn and expand? The Spring energy is unusually pressurized, so don't worry if you're not feeling on an even keel, few are! All that matters is you keep adjusting back to a centered place. On an individual level, a Grand Cross of four squared planets in April intensifies and highlights the polarities within us. If we are able to use its energy because we want to help ourselves or someone else, we can have strong, strong energy to get something done that's difficult. Being "on your own side" allows you to move forward with this energy. This time will deepen our need for inner peace. It makes us search for what we stand for and value. We seek to exist on ever more truthful levels that keep life manageable. Innovations in our personal life will entail cleaning out and clearing out, especially the first half of the year. Positive Response to Pressure: The Year of the Mighty Collaborators: Heroes come out when crises emerge! With courage and candor, collectives of Concerned Citizens for Planet Earth begin to operate full-throttle. We'll hear of innovative solutions and how we can benefit from streamlined processes. According to a Mayan shaman I heard recently, there's hope in that we have a new 25 year cycle to look forward to, in which we can make up for having blown it so far as planetary stewards by trying much harder from now on. Or else. Personal Guidance: It's easy to get out of balance in excessive 2014. The best time to establish personal health routines is right now in the beginning of the year: make a ceremony out of personal stability with the twenty minutes of exercise you do in the morning, or make time for exercise classes if that's what works; diet and health routines deliver the balm of well-being and you'll want them in place by Spring. We could see our personal bottom and our personal top, and you could reach both in the same year. This is no time to judge yourself: performance in different areas of life varies. Of all years, individuals benefit from increased self-understanding and self-acceptance. Remember Edison: something like 10,000 failures before he succeeded to make a light bulb. In the long run all that counts is showing up. For all signs: Success and projects in 2014 take effort and grit. Banish hate! If it isn't in your repertoire of emotional responses to yourself or anyone else, you will avoid connecting with a lot of weird energy batting around the planet this year; don't align with the weird side of 2014 because it's a mile wide. Aries, Leo, Sagittarius, Fire signs: This year is about getting your fire re-ignited. Now you feel free to do what brings you prosperity. It's going to be hard if you must know what's going to be successful; never mind how things look now. Do what you find most compelling, it leads to success. Cancer, Scorpio, Pisces, Water signs: The route to prosperity begins with having to clear things out of their lives, then knowing what it is they're willing to put energy into, and being willing to start at the beginning of something. Recognize you have the tools, the strength, and the inner resources to begin in this freer place. Gemini, Libra, Aquarius, Air signs: You have better connections and backing or support this year, yet you're keenly aware it's still up to you and your work, and how you follow through, to make a success out of your better prospects. But you have a very good running start with plans that have already started before the year begins. Taurus, Virgo, Capricorn, Earth signs: This is a year where you may not see revenue from your new ideas, but you can get invaluable feedback. Don't overextend yourself investing in what's new: you're more in the dreaming-up and experience-gathering phase. Also by Elissa Heyman - 2014 Psychic Impressions. Psychic Astrologer Elissa Heyman practices psychic counseling and spiritual healing in Santa Fe, NM, and by phone, anywhere, since 1979. She also facilitates spiritual healing and intuition circles. Phone; 1-505-982-3294. Elissa's website offers a free monthly newsletter, guided meditations, essays on metaphysical subjects, and personal guidance. www.ElissaHeyman.com Sign up for Elissa's Monthly Psychic Newsletter.